Here in the Goldman family, we enjoy sharing our tips and tricks to our exciting experiences! 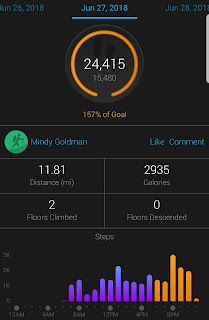 Did you know, a person could average about 10 miles of walking at a Walt Disney World park? It's true. 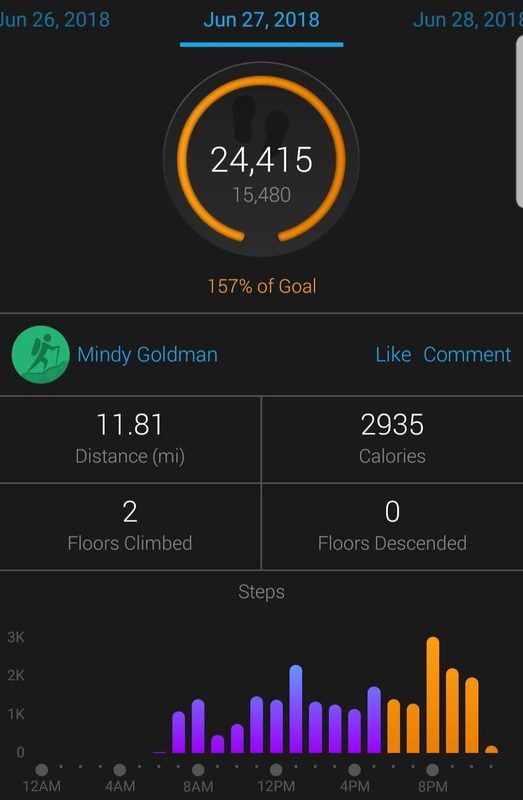 My fitness tracker confirmed that little tidbit of information. As a fairly active adult, a 10 mile day at the park is all fine and dandy. But add a 3 year old into the mix...well 10 miles of walking is a bit much for those little legs. It was an absolute no brainer that we required a stroller for our family trip to Walt Disney World. 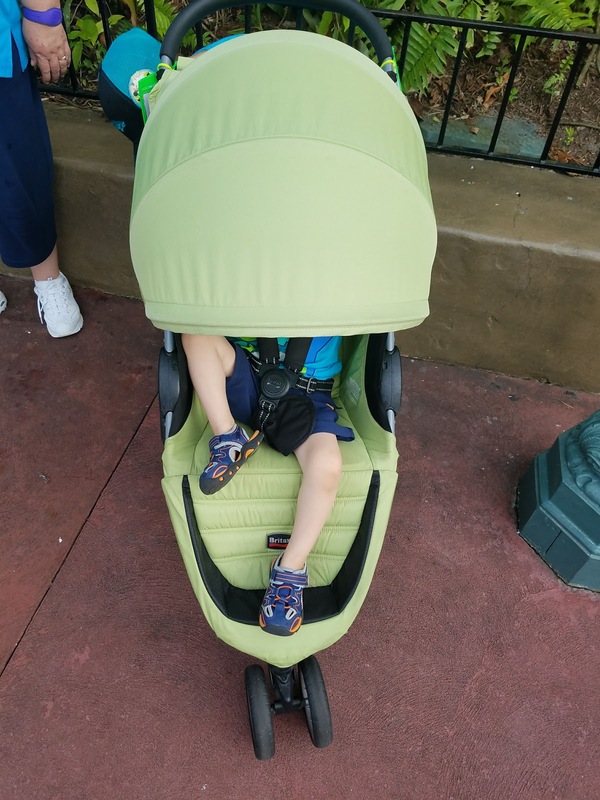 There are a few choices regarding using strollers in Walt Disney World. Some folks prefer to bring along their own stroller. Not a feasible option for the Goldman Family. Therefore, we made a decision to rent a stroller. Disney does rent strollers in the parks, but after dropping those strollers at the gate at the end of a day walking about 10 miles, you would then have to carry the little kiddo to the next mode of transportation to get back to your hotel. That is enough reason for this family to go with Option 3, renting from an outside company. A little FYI for those of you staying on Disney property, there are a select number of stroller rental companies that have the approval from Disney to leave rentals at Bell Services. Those select companies are NOT your only choices. The "'non-approved" companies will make arrangements to meet you in person at your resort. We've done it on a previous trip and it really was no hassle. Staying at Shades of Green this time around, we didn't have to worry about meeting anyone, as Shades allows rentals to be left with Bell Services. 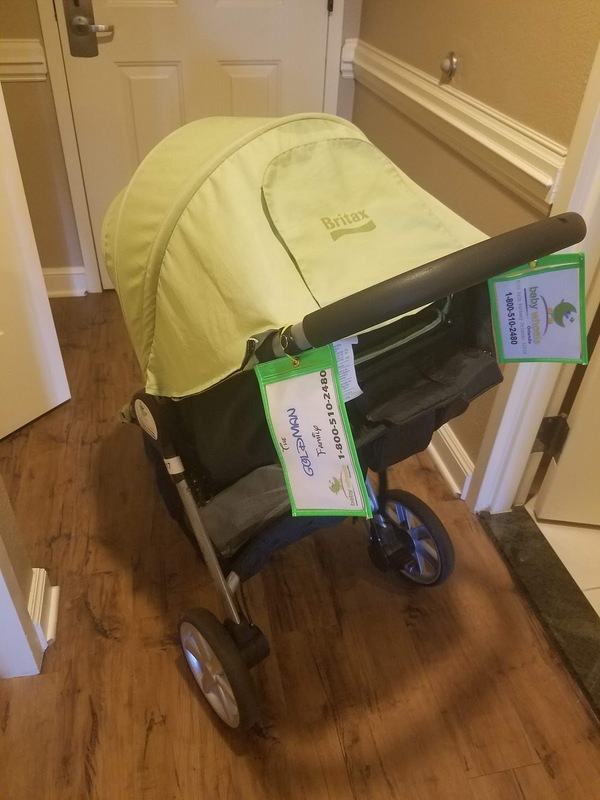 We chose to rent from Baby Wheels Orlando. Baby Wheels is a family owned and operated company. I first heard about Baby Wheels from Touring Plans, my online Disney family for the past 6 years. 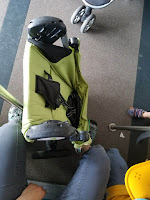 Our experience with Baby Wheels was great from reserving our stroller, to dropping it back off at Bell Services. Baby Wheels offers 8 different stroller options, including singles, doubles and infant travel systems. 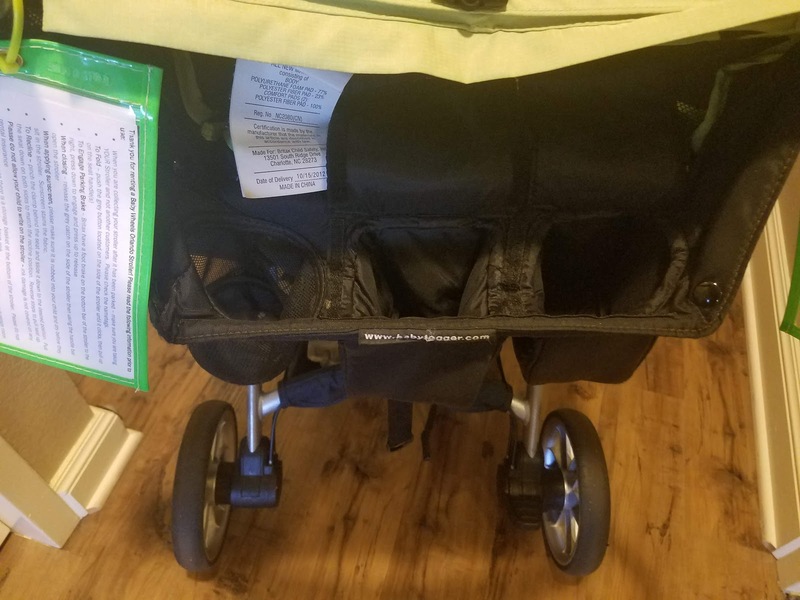 Every stroller comes with a rain cover and parent console. The GT models also include a small soft sided cooler. The Baby Wheels website is very easy to navigate. It is very easy to compare the different options right from their front page. Each stroller option lists its rental price per night, child weight limit, and dimensions folded and unfolded. A single stroller was all we needed for our feisty 3 year old. And since he's a pretty small dude, we could go with a stroller with a lower child weight limit. On our trip 5 years ago, we used a City mini GT. It was a great option, but this time we opted for the slightly smaller and lighter stroller. With the Single Stroller option, Baby Wheels provides either a Britax B Agile or a Baby Jogger City Mini. That's probably the hardest part of the whole process, choosing which stroller is right for your family. After you click that "Book Now" button, is all very simple. 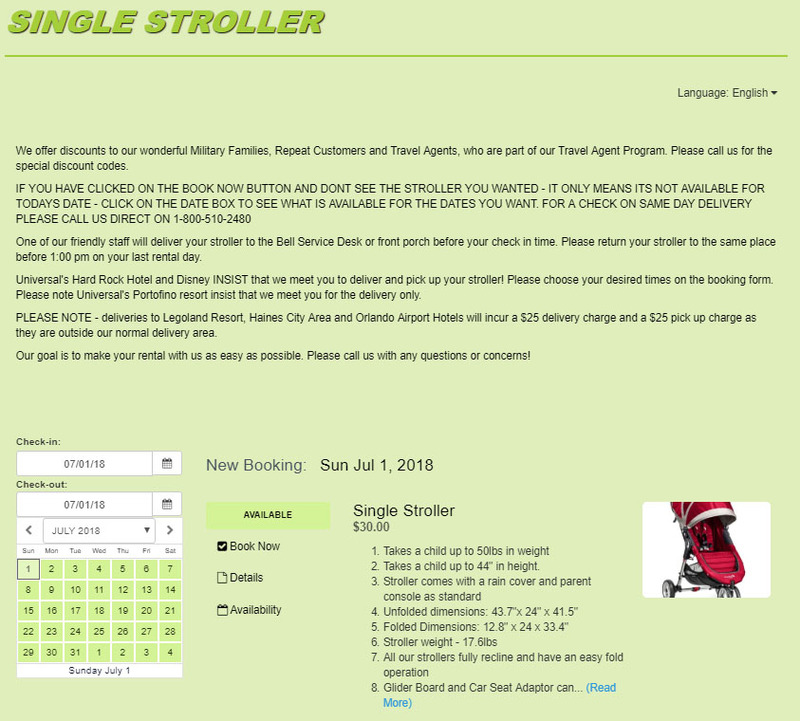 Baby Wheels gives you all of the information right on the booking page about the procedures on delivery day for your resort. Select your Check-in and Check-out dates. If the calendar is green, a stroller is available. The remainder of the process is super straight forward after you click "Book Now". There are a few other options you can add to your rental including insurance (which I would suggest because things happen), a case of bottled water, a glider board and even a snack sack. 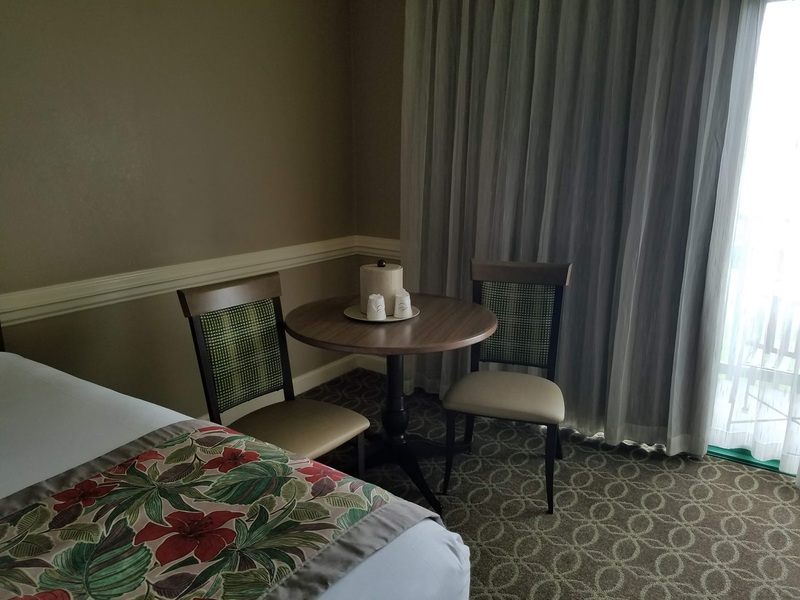 To finalize the process, you will indicate the resort you will be staying at, and approximate arrival time which is mostly used for the resorts that require an-person meet drop off. Like I mentioned, we didn't have to worry about an in-person meet, so our stroller was waiting for us when we arrived at Shades of Green. 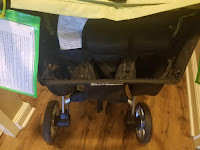 it was easy to pick our stroller out at Bell Services because Baby Wheels puts a name tag with our Family Name, which is big enough to pick out in a sea of stroller at the parks. 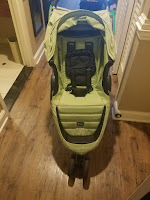 We ended up with the Britax B Agile. This model, and the bright green color, helped it stand our from the numerous City Mini's rentals in the parks. The size was perfect for our Littlesthead. He could sit comfortably and it reclined fully if he wanted to lie down. The canopy is very big and gives plenty of protection from that Florida sun. The parent console is a very useful accessory. It has one designated cup holder, and 2 other compartments with covers that fold down. We constantly had all 3 compartments filled with cups or our trusty misting spray fan. The basket under the seat was also super roomy. It could easily fit a change of clothes for Littlesthead, the rain cover for the stroller and rain gear (because it's summer in Florida and rains almost every day). When it was time to get on one of those buses, the stroller folded up nicely. It just takes a push of a button, and a pull on a strap. We did need to get the rain gear out of the bottom basket, or it didn't fold up correctly. It was light to carry and didn't take up a ton of space, which is ideal for a crowded bus at the end of the day. 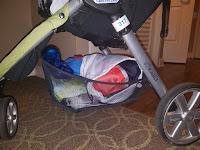 At the end of our trip, I made sure all of our belongings were out of the stroller, the rain cover was in its bag and back in the basket, and that the stroller was in a condition just as I received it. I wheeled it down to our Bell Services where it waited to be picked up by a Baby Wheels representative. I don't know when our next family trip to Walt Disney World will be, but if we require a stroller, I know that I will use Baby Wheels again, and would definitely suggest them to anyone looking to rental a stroller during their trip to Mickey's Florida home. "Standing here, it's all so clear. I'm where I'm meant to be." School is out for Summer for the Goldmans. This year we are celebrating ALL the things in a B I G way! 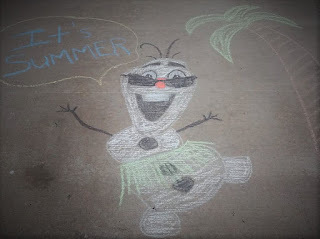 We kicked off the end of school with our tradition of driveway chalk drawings and water games. This year's chalk drawing gave a little foreshadowing into our adventure that was to start the following morning... a trip to Walt Disney World! It has been 5 years since our last family trip to Mickey's home is Orlando. Littlehead is a freshly turned 9 year old, and grew quite a bit since that last trip. This thrill seeker was very excited to have the opportunity to ride ALL the attractions this time around. Littlesthead is a very compactly-sized 3 year old who couldn't be more thrilled to meet some of his Disney heroes and see Mickey's house for the first time. We did a few things different on this year's trip than our previous family trip 5 years ago. 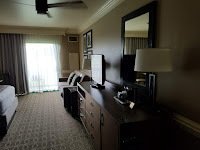 We stayed at Shades of Green, a non-Disney owned resort on Disney property that is able to utilize some of the Walt Disney World resort guest benefits. As Shades of Green guests, we were able to make Fast Pass selections 60 days out, dining reservations 180 days out, and take advantage of Extra Magic Hours, just like those staying in one of the 28 Disney-owned properties. You have to meet particular military eligibility requirements to stay at Shades of Green. We are fortunate enough to be eligible for stays at Shades of Green. To see if you or your family meet the requirements, visit the Shades of Green website. There are two wings: the Magnolia and the Palm. 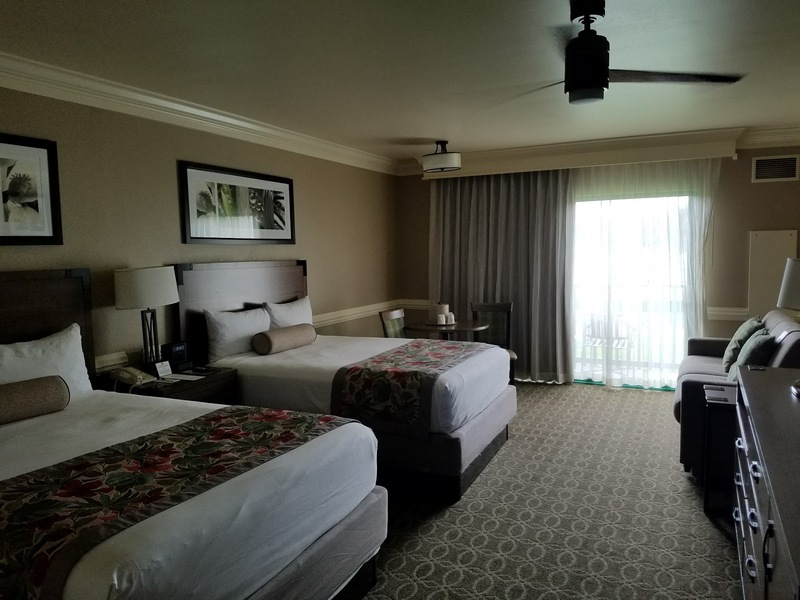 As of this moment (June 2018), the Palm Wing has been refurbished. The Magnolia Wing is in the midst of its refurbishment. We stayed in a standard room in the Palm Wing with a Golf Course view. These rooms are HUGE at 450 square feet! There are 2 queen beds and a sleeper sofa. There is also a nice little dining area with a table and chairs, a mini-fridge, and even a balcony. We had plenty of room with 2 adults, 2 kids and all of our stuff. One downside of staying at Shades of Green, you cannot utilize the Disney Magical Express. But, there are a few options for transportation from the airport to Shades. We made reservations with Sunstate Transportation. They are the preferred transportation of Shades of Green, and they were very reasonably priced. 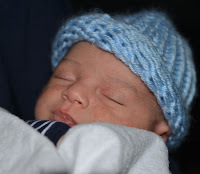 We were able to book a passenger van for 4 adults and 2 kids, and they provided a car seat for Littlesthead. I received a text confirmation from our driver, who was very helpful and responsive when our flight into MCO was delayed. Our driver at the end of the trip was great as well. As for getting to and from the parks, Shades of Green does have its own bus system. However, it does have a specific schedule. If you miss the pick-up time, you are waiting probably another hour for the bus again. And if you have pre-park opening dining reservations, the Shades of Green buses will not get you there. BUT... you can utilize the Disney transportation to and from the parks, you just have to make a walk over to the Polynesian resort. 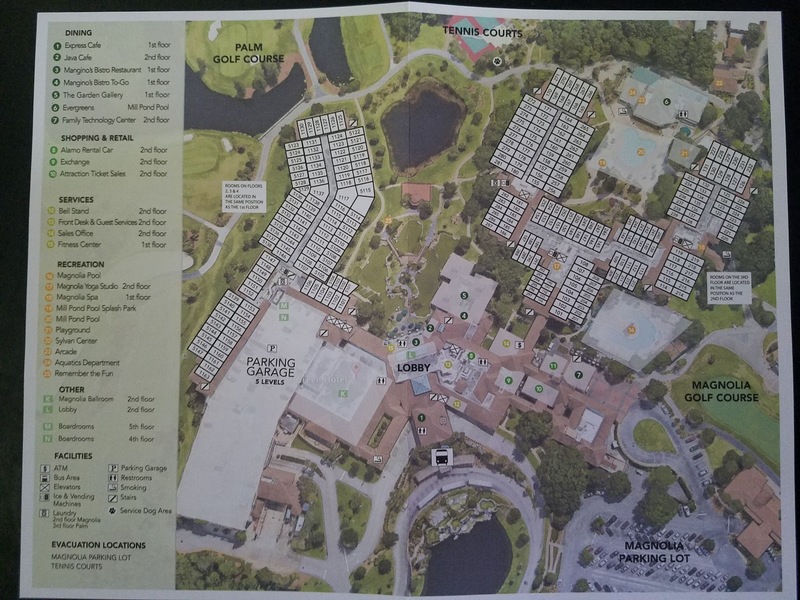 Depending on your speed of walking, it can be an 8 - 12 minute walk from the front door of Shades of Green to one of the transportation methods the Polynesian has to provide. Bonus, Disney buses, monorails and ferries run very frequently. Some days we were fine using the Shades buses. Other days, like the day of our 8:20am reservation at Hollywood & Vine, we hoofed it over to the Poly and used their bus. Easy peasy. 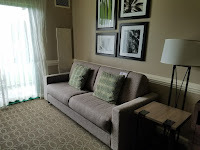 We had a great experience at Shades of Green, and are fortunate to be eligible to stay there. If you and your family are eligible, Shades is a great option. It is practically a deluxe resort at value resort prices depending on the level you qualify for. It felt like home, especially after a long (or even short) day at the parks for this crazy bunch. As an adult, it's somewhat frowned upon when you show up in Walt Disney World in a full costume. Unless it is Mickey's Not So Scary Halloween Party, then by all means... dress the part (some rules do still apply)! But, the way around the no costume rule, is an awesome thing called Disney Bounding. There are sites and Pinterest boards dedicated to this movement. To be a successful Disney Bounder, you can utilize clothes straight from your closet. As a Disney fan, and a fan of dressing up to play a part, be it for Halloween or a play, Disney Bounding is definitely right up my alley. So, I decided to give it a try during my latest trip to Mickey's House. 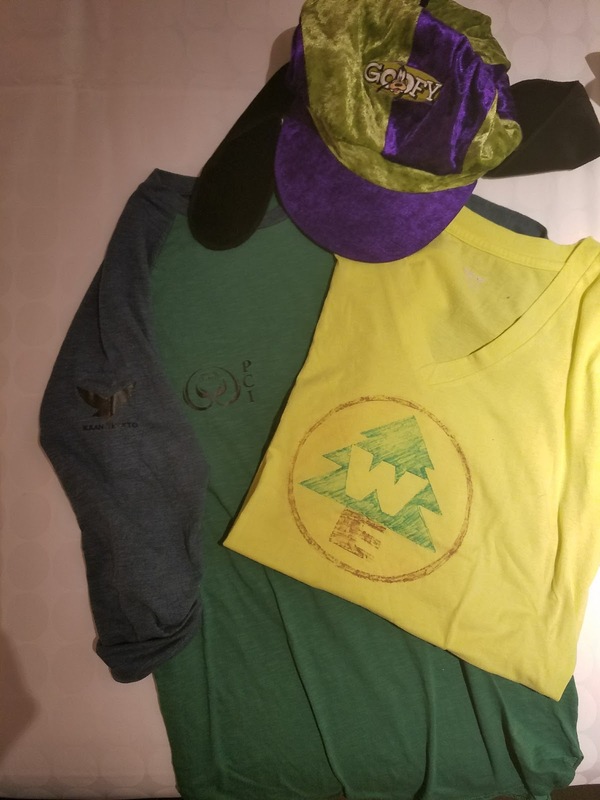 I had to pad my wardrobe a bit, but thanks to some local Thrift shops and sales, I was able design 4 different Disney Bounding outfits. 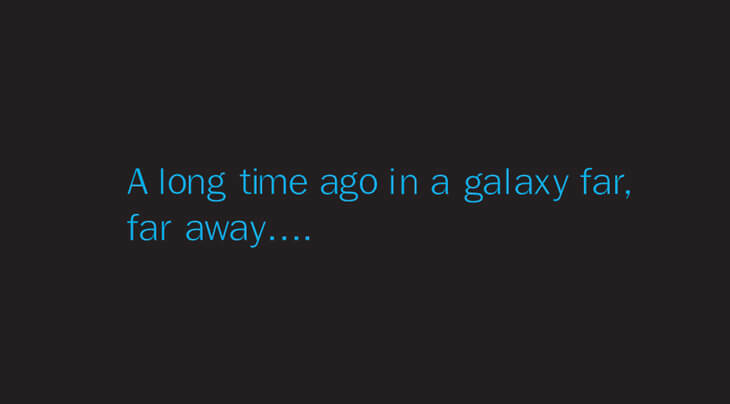 there was a girl who was not only a fan of Star Wars, but a huge fan of Han Solo. 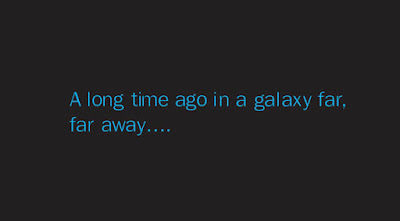 That seems like a valid reason to create a Han Solo inspired outfit. I found an awesome pair of capris with eyelets along the side, perfect for adding Corellian Blood strips, at my local Marshalls. The Henley shirt and black denim vest were both found on Amazon for a decent price, and thanks to Amazon Prime, shipping was FREE! Naturally, this Han Solo had a meet and greet with the number one Wookiee, who recognized his best buddy immediately. My three old son is quite the fan of Big Hero 6. What's not the love? A big huggable robot who moonlights as a Super Hero! I knew that I was going to have the opportunity to visit Baymax in Hiro's workshop. Every Baymax needs his Hiro. And that was my choice for Disney bounding in EPCOT. 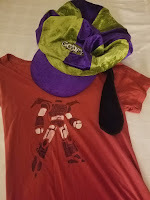 I found a red tee at a Thrift shop, that was perfect to use my craft skills, and add the robot as seen on Hiro's tee. I only had to go as far as my closet for the cargo capris and the blue hoodie to complete the ensemble. The photo opportunity would not have been complete with a Ba La La La La La La. Animal Kingdom took a little extra thought. I knew the Wilderness Explorer was an obvious option, because the Wilderness must be Explored! But I also wanted to incorporate something from the new World of Pandora. Well, there are two groups who help provide us Terrans an unforgettable experience in Pandora: Alpha Centauri Expeditions (ACE), the eco tour group responsible for getting us to Pandora. And Pandora Conservation Initiative (PCI), the group of scientists and conservationists who give us the ability to "fly"on a Banshee through the Mountain Banshee Project. I am a scientist at heart. In fact, there was a time in my life I was going to be a Marine Biologist, and science still is a passion of mine. If I were relocated to Alpha Centauri, I would see myself working as a member of the PCI. In my imagination, I wouldn't just be a part of research, I, through my Avatar, would be an Ikran Makto... a Banshee Rider. And that is just what I became on my visit to Pandora, thanks to my Disney Bounding idea. There we have it. My first attempt at Disney Bounding in Walt Disney World. I hope to incorporate more ideas on our next visit. I'm always looking for the not so obvious. It was a different way to spend St. Paddy's Day... awake before the sunrise, a quick stroll from the hotel, and a non-alcohol related tour in Walt Disney World. This was the day we decided to take the Keys to the Kingdom tour at Magic Kingdom, and it was MAGICAL! A little bit about the Keys to the Kingdom tour... it is a 5 hour walking tour. It is primarily outdoors, so dress for the weather. Tour-goers must be at least 16 years old. A discount is available for Annual Passholders, DVC members, and Disney Chase Visa Cardmembers. You may not use a camera, video equipment or a cell phone during the tour. Yes, they know you will most likely have these things on your person while in the park. Just do not have them out and in use during the tour. Keep the cellphone in your pocket, or backpack, and you will be golden. We started our day bright and early at the Contemporary Resort, with a little breakfast to gear us up for our day. We utilized the walking path from the Contemporary to Magic Kingdom. This is a fantastic benefit of staying at the Contemporary...a few minute walk from door to gate. We were so early, the security checkpoint along the path was not yet open. Perfect opportunity to grab some beautiful shots of the scenery. When we were able to continue on our path, we were able to proceed to the gates at the far left, bypassing the other park goers waiting to enter the park. Those who have pre-park opening dining reservations and early tour reservations are let in through that specific gate when the all clear is given. Yes, there is a list, and they verify that you are on it. This was our view upon entering Main Street... a clear line of sight occupied only by Photopass photographers. That allowed us to get a fantastic shot with Cinderella Castle with barely a person in site! Well, a person in site. Disney fanatic achievement unlocked, nonetheless!!! After taking a few minutes to take advantage of the opportunity to catch the photographers along Main Street, we walked over to the Town Square Theater where we checked in, selected our lunch items from the menu provided, picked up our name tags and listening devices, and patiently waited for our tour guide, Caroline, to gather us up to begin. The tour began just outside the Town Square Theater, with some information about Main Street itself. I, as a Disnerd, have read quite a bit about Walt Disney World. I knew some of the information our Tour Guide was sharing, but still learned so much more. Plus, it was great to have someone point out the tidbits I had read and be able to see it in person. 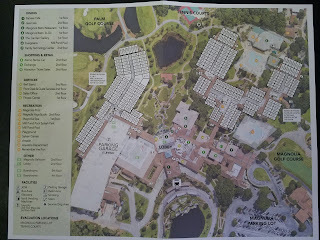 Our tour went in a clockwise direction around the park with detours into backstage areas, including the Utilidors. particular tour will include. We also enjoyed a nice lunch break at the Pecos Bill Tall Tale Inn & Cafe. As I mentioned we had preselected our lunch from the menu provided at check-in. By the time we arrived at Pecos Bill's, our food was ready in a closed off area of the restaurant, reserved for the tour. As the tour concluded, we were brought back to Main Street via a backstage area just behind the Town Square Theater. We discovered that Caroline had just completed her first ever solo tour, with her assessor/mentor acting as just another member of the tour. She passed with flying colors! We all congratulated her on her newest accomplishment. The Keys to the Kingdom tour was completely worth it! If you are debating on booking this tour, DO IT! It was a great way to spend part of the day at the Magic Kingdom. Never did I feel that the magic was ruined. In fact, I think it added to it. This is definitely a must-do for any Disney fan. Just imagine how cooler I'll be....IN SUMMER!! Olaf has been waiting for his moment in the sunlight! With two boys, Summer can be a fun...and interesting time. School's out, which means that Littlehead's year in 1st Grade is over, and Momma's Preschool year is over as well. And Littlesthead is just enjoying being a 1 year old. So, that means Summer adventures can commence. There will be some Cub Scout fun throughout the Summer. Our local Cub Scout Day Camp is fast approaching. And of course there are Pack and Den activities to keep us busy. Vacation will be another week of awesome fun. BUT WHAT ABOUT THE REST OF SUMMER??!!!! I'm a typically active person. I like to be outside when it's possible. Filling up the baby pool, turning on the slip-n-slide, riding bikes, going on hikes... all of these are things we like to do. Rainy day? Board games, Legos, reading and whichever subject we have chosen to study throughout the Summer. We've learned about bugs, birds, the human body, robots and currently learning about astronomy. All these fun ideas, but how to make sure we do them and not end up at the ol' standby... TV, Ipad, Video games? It does make for a challenge to not turn into screen time zombies. Thanks to this wonderful thing called the Internet, I have found a few solutions to solve this Summer bummer situation. 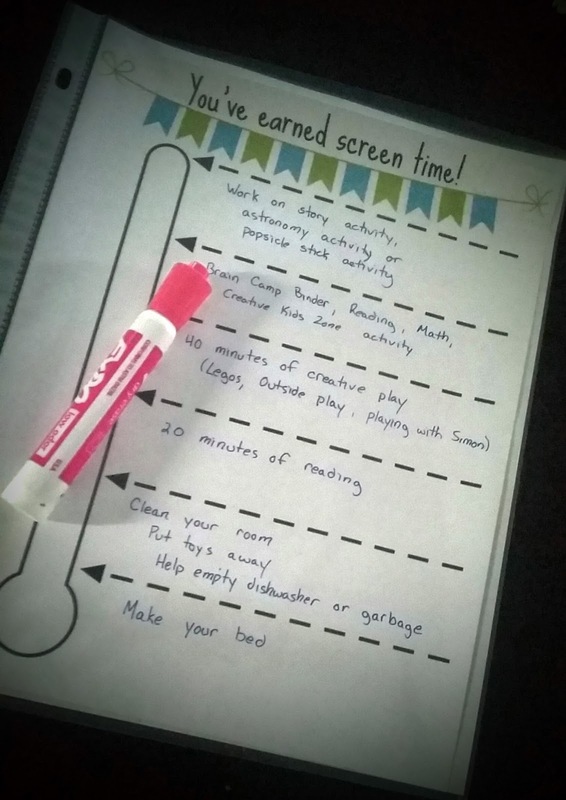 How do we limit some of the screen time? It's way too easy for my littlehead to plop down with his Ipad or Netflix. I found quite a few screen time charts or incentive systems. I came across one in particular that I felt like would work with my 7 year old from the Shady Lane. This is the blank version, but there are other versions as well, including a different color scheme and pre-filled in items. I printed out a copy, filled in the tasks and slid the sheet into a clear plastic sheet protector. As my littlehead completes a task, we can color in the meter with a dry erase marker until he earned his screen time, wipe clean and start again. I incorporated reading time (which goes along with our local library's summer reading program), easy chores, and activities from two other summer boredom busters I will mention in just a minute. My littlehead has always loved activity books. It could be my doing. Ever since he was old enough to wield a crayon, we carried coloring books or activity books where ever we went. Going out to dinner, a long ride in the car, the doctor's office? Let's load up the backpack with activity books. In more recent years, a majority of those activity books became Math related. Man, does he love Math. We have inadvertently been preventing Summer Slide with these fun activity books, but he doesn't need to know that. Of course it was a no brainer when I came across the Summer Brain Camp binder printables from Imagination Soup. There are activities for Reading, Writing and Math. The free printables include 3 lists of various activities and reward coupons. They also provide links to various resources to accompany the listed activities. It's pretty easy, print, slide into sheet protectors, and put in a binder. I put a binder friendly pencil pouch to hold dry erase markers. 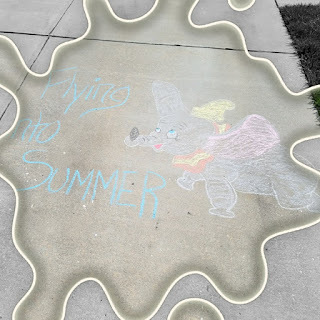 My FAVORITE Summer Boredom Buster that I found is from Over the Big Moon: 60 Days of Summer Fun! All you need is some Popsicle sticks, a way to color code them, and the printable activity cards. There are completed activity cards and blank cards that can easily be edited in Photoshop. I really only had to edit the Green Field Trip cards and the Silver Special Activities. This year, with my Littlehead being in Cub Scouts, I added a new color category: RED = Hiking Locations. What on earth do you do with all these popsicles? At the beginning of the week, Littlehead picks a popsicle from each color, except for Silver. We find the coordinating activity card, and refer back to Over the Big Moon for activity information or recipes. That's right, they have all the needed information and resources linked right on the website! We try our best to complete the activities before the week is up. Sometimes we end up a little more busy with camps, doctor appointments, sleepovers at the grandparents', or some much needed errands. With all of these Summer Boredom Busters combined, I should never hear the words "Mooommmmmmmm..... I'm booorrrrreeeeeddddd..."
I hope these suggestions can work for you family as well as it did for mine. Have a great Summer! Oh how rude of me. I completely forgot the formal introductions to our littlesthead. It was a pretty cold day on February 16th. There was some snow left on the ground when we went to the hospital. It was a planned c-section, so there was no rush to the hospital. After all the pre-op and such, the littlesthead was officially born at 11:24 am. What this mama remembers from the operating room... some super silly things. When asked how I was feeling after getting epidural and whatever other fluids they were pumping into me, my response was "I'm actually hungry". I was! I wasn't allowed to eat anything for breakfast since my food/liquid intake had a midnight cutoff. Right around that 11:24 mark, Dr. Gotzman, who was performing the procedure, says "What are you holding onto in there?" Apparently, the littlesthead was a grabby little guy and got a grip on something. Good news, he did not bring any kind of souvenir out with him. And, the presentation to mama and daddy over the blue curtain...littlesthead proceeds to show his love by spitting at his mama. Yeah... love you too buddy. Littlesthead weighed 6 lbs 5 ounces and was 18 inches long. So, now, here we are...at the 3 month mark. Wait?! What?!?! 3 months already?!?!? My how time flies. And look how impressed he must be to be 3 months old. Littlehead and littlesthead are getting along well. Big Brother is enjoying his promotion. He loves holding his little bro, and entertaining him. It's fun now that littlesthead smiles and laughs. He is even starting to recognize familiar faces, including Big Bro. I mean, look at the brotherly love. And let's say, these two definitely look like brothers. Don't believe me...see for yourself. So, yes, we are in the midst of the Cloth Diaper adventure with the Littlesthead. We are quickly approaching 3 months since the littlesthead was born. 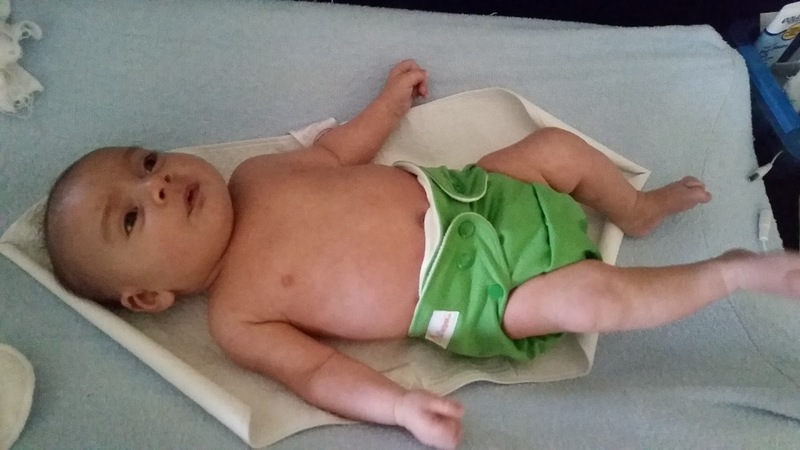 We have been cloth diapering for a little over a month, well part-time. I have a few different brands that I purchased to try out. 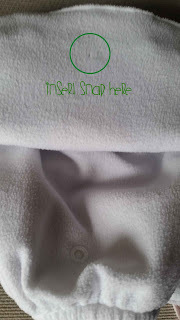 One of the brands that I came across thanks to Fluff Love University, is Lil Helper. Lil Helper has been around since 2009. The company was founded by Mohammed Gandhi and Nader Abu El Samid, and it's sole mission is "to provide quality products and fantastic customer service". 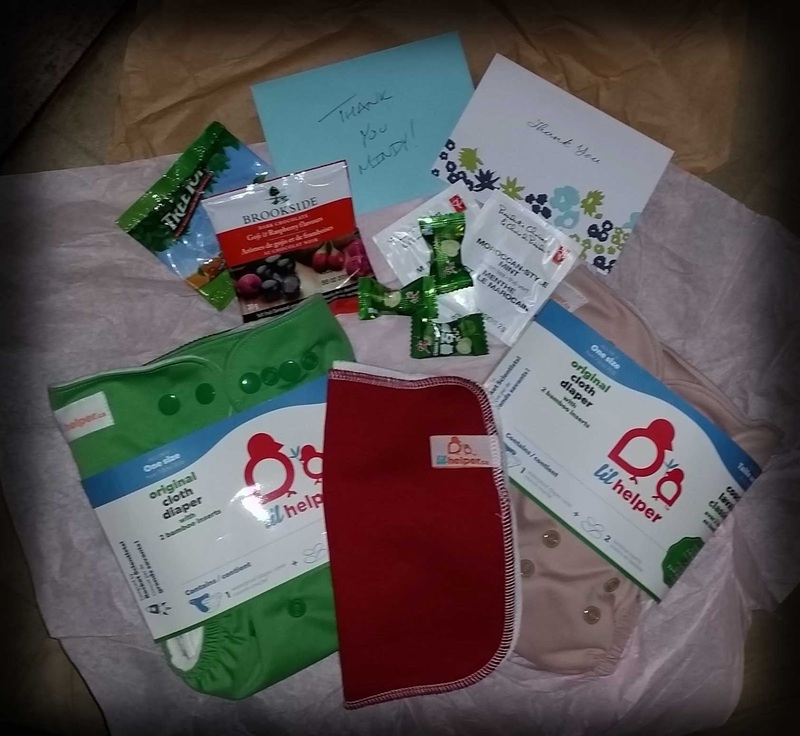 "Apart from providing parents with a greener alternative to disposable diapers, Lil Helper also started the Baby Do Good program, which gives 1 brand new cloth diaper to a family in need for every 3 diapers they sell." After finding out about Lil Helper, I decided to give them a try. At the time, they were running a special, 50% off on 2 Diapers and FREE SHIPPING!! Why would I not take advantage of that? The catch, I had to select 5 of my favorite colors, and they would pick 2 to ship me. Well, apparently word got around, and the good people at Lil Helper actually had to wait for their diapers to get restocked. I received an email from Mohammed informing me of the delay and that this was "not business as usual". Okay, so my order is delayed. No problem, especially since they notified me. A check mark in the great customer service column. Before I knew it, I received my package from Lil Helper! And it didn't just have my diapers! I was surprised to see some extra goodies included. They sent a cloth wipe, a hand-written thank you note, tea and some treats! Another check mark in the great customer service column. Next step, I prepped my new diapers for use, and was a little sad to discover (dun dun dunnnn) that one of the inside snaps that connects to the liner was missing! So, I sent a nice email informing them of the missing snap, and even sent the picture. Well, guess what? Shortly after, I received a response that (1) they needed me to resend the picture b/c they were in the midst of migrating to a new help system and (2) they would send me a replacement cover. I asked if they'd like me to send the now defective one back and the answer was...No, go ahead and keep it. After I got them all prepped, we gave them a test run. I do dig the Lil Helper diapers. They fit pretty darn good, and are fairly trip. Now, they came with two inserts, a large and a small that snap to the cover. They are made to attach to each other and to the cover. I have only been using one at a time. If/when I decide to cloth at nighttime (we do disposables now) doubling the inserts would probably be a good idea. What do I say about Lil Helper? All good things. The product is great. The customer service is fantastic. And the fact that have the Baby Do Good program is AMAZING! Two thumbs up from this mama. And if he could do it, another two thumbs from my littlesthead. If you are thinking about trying Cloth Diapering, please consider Lil Helper. They are always running specials it seems. Go ahead. Check them out!